Soak the corn husks in warm water until soft. Blend with an electric mixer Maseca corn masa mix for tamales, corn oil, salt, baking powder and the chicken broth to obtain a consistent mixture. Shred the chicken and marinate in the green salsa or tomatillo sauce. Spread masa evenly over corn husks, and spread a spoonful of marinated chicken on top of the masa. Fold the sides of the corn husk to center over the masa so that they overlap to make along package. 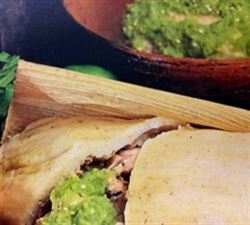 Fold the empty part of the husk under so that it rest against the side of the tamale with a seam. Place the tamales in a steamer and cook tamales for 35-40 minutes. Check every 20 minutes.The tamales are cooked when they separate easily from the corn husk. Makes 36+ tamales depending on the size. Enjoy this delicious chicken tamales Mexican food recipe! Really delicious masa recipe! I used half of a cup less of water because it was to moist. I make roast and red salsa for the filling. Perfect! Yummy and delicious. This one is good and easy to make and great recipe. I made this recipe in Pakistan and add more lemon juice & black pepper to make more spice. I also made this recipe itself from recipe network ( www.sooperchef.pk ). Thanks for sharing such a taste full recipe. How many dozen can you get from this recipe? Merchant Response:Sorry! It makes aprox 36 tamales depending on the size, so it's good for 12 or more people. Absolutely, delicious masa recipe! Made this masa for a my husband's work potluck and my tamales were a hit! Moist and tasty! Won't purchase pre-pared masa anymore. These are really good, my family asks for them atleast once a week and my friends always ask when im making more!!!! My daughter and her friends made these and used the verde sauce. They were a huge hit at our house. We will be making these on a regular basis. Highly recommend.